3 years ago I took this photo. It turned out to be my most favourite photo I’ve ever taken. It’s a day I’ll never forget. 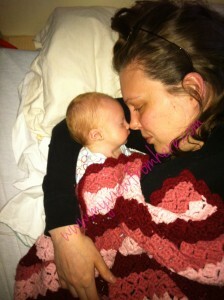 I was past my original due date and I was still in the hospital hoping and praying I’d be home sooner than later. I was done with this surprise. I was done being separated from my family. I was done pumping behind a curtain. I was done having nurses, Doctors, residents, therapists, social workers coming through the door interrupting a nap/a phone call/lunch/cuddle time/a rare quiet “me” moment. I was done. All I wanted was to cuddle my newest son and be left the frick alone. People constantly picking out characteristics that *might* be something…things that make him different….things that make him HIM. It was one of the hardest things I had dealt with at that point in time. It was the morning after we were told we were being sent to another hospital to see Dr. Hill to get Noah’s eyes checked as per the geneticist. He suspected CHARGE so this was one of the last tests left. It’s where we learned about his colobomas. I can’t even explain to you how devastated I was when she told me what she found. There was just something about her telling me my son’s eyes did not work as they should that sent me into my deepest despair yet. I just couldn’t understand how these beautiful big blue eyes were broken. They were the first perfect thing I saw when I got to hold him and now they tell me they were broken. They couldn’t tell me what he could see or what his future would be like but there was just something different in my response. I dealt with the hearing loss. The swallowing issues. The palsy. The misshapen ears. The reflux. The everything. But for some reason his eyes hurt the most. It still does. I shed a lot of tears over his vision. Noah had a very rough night and so did Mom. All I wanted to do was sleep. All he wanted was to be left alone and be comfortable and be with his Mom. I asked the nurse if she could disconnect his wires or at least give us a mobile version so he could reach my bed. I wanted to lie with him and not in that God forsaken hospital bed with bars any more. I’m sure she saw I was broken and she agreed. I got him over to my bed by the window and as soon as we lay down he went nose to nose and for the first time in hours he stopped crying. He just fell asleep. It was one of the first times in 4 weeks I almost forgot where I was and everything felt “normal”. It was just me and him cuddling. We were the only 2 people in the world. I didn’t feel broken in that moment. It was that moment that renewed my strength and kept me going. I see so much more in this photo than other people looking at it I’m sure. There’s stuff I can’t even explain. I won’t explain. Seeing him wrapped in my arms where I should be. I see the grief, the sadness, the heartbreak but I see the love, the happiness, and the peace in that moment. There was nothing like it. I cherished it for the 30 minutes until rounds started and it all started over again. But, when Dr. B and her team came in she told me not to move, she didn’t want to strip him down and assess him. She let him stay right where he was. I was so grateful. Hearing everything while cuddling your baby wrapped in your own most favourite blanket made hearing the new news of the day a bit easier to take in. This will forever be my most favourite photo of Motherhood. EVER.